The Rebel Sweetheart. 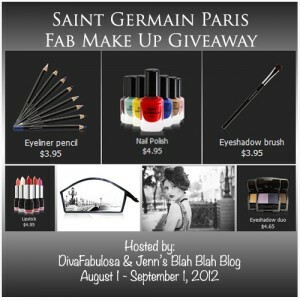 : Sign-Up | Saint Germain Makeup Giveaway. Diva Fabulosa and Jenn's Blah Blah Blog team up once more for another fab giveaway! Happening from August 1 - September 1, this event will have 20 cosmetic bags up for grabs. That's $450 worth of prizes!